A Lancashire chef set off on an epic 200-mile charity walk from Blue Planet Aquarium, Cheshire Oaks today (Monday, November 17th). Andrew McMaster, from Skelmersdale, is aiming to walk to Westminster in London to raise money for the mental health charity Mind. The chef is aiming to complete the walk within eight days and is hoping to average around 25 miles every day. Andrew decided on attempting the epic journey after tragically losing his uncle to suicide last year. “Mental health is something I feel very strongly about as it’s something that affects people from all walks of life; from Alzheimer’s or depression to anxiety, obsessive compulsive disorders or even something as extreme as suicide, which I sadly lost my uncle to last year” said Andrew. “As a result mental health is something I want to raise money for. Mind is such a wonderful organisation, however it exists purely from charity donations and fundraising,” he added. Local Mind groups support over 250,000 people across England and Wales. Their services include supported housing, crisis helplines, drop-in centres, employment and training schemes, counselling and befriending. 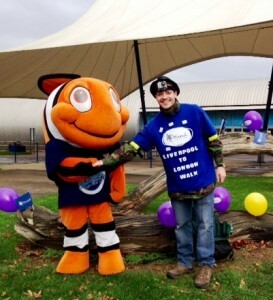 Blue Planet Aquarium’s Park Director, Andy Hygate, said: “We’re delighted Andrew chosen the aquarium to set off on this amazing personal challenge and we all wish him the best of luck. “We are also pledging the proceeds of our November and December Charity Face Paints to Mind as a gesture of support,” he added.